Termination of protein synthesis in eukaryotes involves at least two polypeptide release factors (eRFs) – eRF1 and eRF3. The highly conserved translation termination factor eRF1 in Saccharomyces cerevisiae is encoded by the essential gene SUP45. We have isolated five sup45-n (n from nonsense) mutations that cause nonsense substitutions in the following amino acid positions of eRF1: Y53 → UAA, E266 → UAA, L283 → UAA, L317 → UGA, E385 → UAA. We found that full-length eRF1 protein is present in all mutants, although in decreased amounts. All mutations are situated in a weak termination context. All these sup45-n mutations are viable in different genetic backgrounds, however their viability increases after growth in the absence of wild-type allele. Any of sup45-n mutations result in temperature sensitivity (37°C). Most of the sup45-n mutations lead to decreased spore viability and spores bearing sup45-n mutations are characterized by limited budding after germination leading to formation of microcolonies of 4–20 cells. Nonsense mutations in the essential gene SUP45 can be isolated in the absence of tRNA nonsense suppressors. Termination of protein synthesis occurs when the ribosome elongation machinery encounters an in-frame termination (stop) codon, either UAG, UGA or UAA, in the mRNA. This stop codon located in the A-site of the ribosome is recognized by a release factor (RF1/RF2 in prokaryotes and eRF1 in eukaryotes), which triggers release of the nascent peptide from the ribosome. Termination efficiency is enhanced by the GTPase release factor, RF3 in prokaryotes and eRF3 in eukaryotes [reviewed in [1–4]]. Release factor eRF1 recognizes all three stop codons , in contrast to prokaryotes where RF1 catalyses translation termination at UAG and UAA codons, and RF2 at UGA and UAA codons . All these proteins are encoded by essential genes: prfA (for RF1), prfB (for RF2) in bacteria [7–9] and SUP45 (for eRF1) in S. cerevisiae [10, 11]. Although the sequences of prokaryotic and eukaryotic release factors differ significantly [see  for review], a "tRNA-mimicry" model generalizing the mechanisms of prokaryotic and eukaryotic translation termination, was proposed . Peptide determinants of RF1 and RF2 involved in the specificity of stop codon recognition have been identified: in both cases a tripeptide (PAT for RF1 and SPF for RF2) was located in the homologous region of both proteins . Recently the crystal structures of human eRF1 and bacterial RF2 have been determined and found to be different [15, 17]. However, when associated to the ribosome RF2, conformation is modified and mimics a tRNA molecule [16, 18]. Thus both eRF1 and RF2 may have comparable structures both of which are compatible with tRNA mimicry model as proposed previously . The eRF1 is composed of three domains. Domain 3 corresponds to the C-terminal part of eRF1 that is necessary for the interaction with eRF3 although there are some discrepancies in the precise localization of the region of eRF1 that interacts with eRF3 [19–22]. Domain 2 is responsible for the peptidyl transferase hydrolytic activity and includes a GGQ motif that has been highly conserved through evolution . Mutations of GGQ (Gly residues) are dominant-negative in vitro  and lethal in vivo in S. cerevisiae cells . The function of domain 1 remains unknown although it was proposed that together with domain 2, it could form a functionally active "core" domain . The role of N-terminal domain of eRF1 in stop codon recognition has been proposed  and supported by mutational approach  and crosslinking experiments . In eukaryotes eRF1 interacts with eRF3 in vivo [27, 28]. This interaction is mediated by the C-terminus of eRF1 [20, 21]. The deletion of the 19 C-terminal amino acids abolishes the interaction with eRF3, causes an enhancement of nonsense suppression, but does not destroy viability. In contrast, eRF1 with a 32 C-terminal amino acid deletion is unable to support viability . Also it has been shown that nonsense mutations (UAA) in the SUP45 gene lead to lethality in the absence of SUQ5 suppressor . However, a viable nonsense mutant has been isolated for the prfB gene of S. typhimurium encoding RF2 release factor. It has been proposed that this mutation reduces the cellular amount of RF2 leading to inefficient termination of translation and autosuppression . In the present work we have isolated five spontaneous nonsense mutations in the SUP45 gene that confer viability in different genetic backgrounds. These mutations result in a decreased level of full-length eRF1, thermosensitivity and lethality in meiotic segregation of heterozygous diploids. After selection for histidine (his7-1 (UAA)) – lysine (lys9-A21 (UAA)) prototrophy, sixteen SUP45 mutants and eighty-four SUP35 mutants among 400 His+ Lys+ revertants were obtained. All sup45 mutant alleles together with the wild-type SUP45 allele from parent strain 1B-D1606 were cloned using PCR. The DNA sequence for each of the cloned alleles was determined. The sequencing of the parent strain 1B-D1606 revealed 6 nucleotide substitutions compared with the published sequence : A69G, G519T, T687C, T702A, G927A, T1008C. All of these, except T702, are the same as those described earlier  for mutant alleles that obviously had a different origin regarding the wild-type strain. All nucleotide substitutions are localized in the third codon position and do not change the amino acid residues. The reason for these differences could be the origin of the strain from Petergoff Breeding Stocks (XII race S. cerevisiae) that has an independent origin  compared to the strains used in other laboratories . Comparison of the mutant SUP45 DNA sequences with that of the parent strain revealed that in all cases only a single-base changed in the coding sequence. Surprisingly, among 16 mutations 5 represented nonsense mutations, resulting in the mutations of sense codon to an ochre (TAA) (four mutations) or (TAG) nonsense codon (one mutation) (Figure 1). The other 9 were missense mutations and will be described elsewhere. Strains bearing sup45-101, sup45-102, sup45-104, sup45-105, sup45-107 that contain, respectively, the following base substitutions: G796T, T159A, T848A, G1153T and T950G, which lead to nonsense mutations, were further characterized. Schematic representation of sup45-n mutations isolated in present work. Position of the mutations is indicated above the SUP45 gene. The numbers under the SUP45 gene correspond to amino acid positions whose codons were changed to premature stop codons. Numbers on the right of arrows correspond to the size of truncated eRF1 protein. All the mutations were defined as omnipotent suppressors after testing for histidine, lysine, adenine and tryptophan auxotrophy; his7-1 (UAA), lys9-A21 (UAA,) ade1-14 (UGA) and trp1-289 (UAG) mutation one present in the parent strain (Figure 2A). Nonsense mutations in the SUP45 gene lead to omnipotent suppression. A. Plate assays showing the growth of yeast strains bearing nonsense mutations in the SUP45 gene (101-1B-D1606, 102-1B-D1606, 104-1B-D1606, 105-1B-D1606, 107-1B-D1606) in the synthetic medium without histidine (SC-His), lysine (SC-Lys), adenine (SC-Ade) or tryptophan (SC-Trp) at 25°C compared with the parent strain 1B-D1606. The types of nonsense mutations in parent strain are denoted under media indications. SUP45 mutant alleles are indicated. Ten serial dilutions of yeast suspension of the same density were used. Five independent clones were tested, representative results are shown. B. Determination of the level of nonsense suppression in sup45-n mutants. UAA, UAG and UGA suppression levels were quantified by measuring β-galactosidase levels in the strains 1B-D1606 (wild type) as control and in mutants transformed with plasmids pUKC817, pUKC818 or pUKC819 bearing a specific stop codon (TAA, TAG or TGA, respectively) in frame that precedes lacZ gene. The efficiency of nonsense codon readthrough (%) was quantified as a ratio of β-galactosidase activity in cells harboring lacZ with stop codon to that in cells without a stop codon in-frame with the lacZ gene in pUKC815 plasmids. The same strains as in Fig. 2A were used. Results are the means of three separate experiments. C. Western blot showing the synthesis of full-length eRF1 (49 kDa) and truncated eRF1 proteins with predicted molecular mass 43.0 kDa, 35.2 kDa and 31.5 kDa for mutants 105, 107 and 104, respectively. (*) Indicates a non-specific band. A search of yeast proteome with the N-terminal peptide sequence that was used for antibody production, revealed the presence of one protein (methionyl-tRNA synthetase, GenBank accession number CAA24627) containing this sequence that has an expected molecular weight near 85 kDa. Cultures of the same strains as in (A) were grown to mid-log phase in medium selective for plasmid and ribosome fractions were prepared. The same amount of each sample was loaded per lane. Immunoblot analysis was performed using polyclonal antibodies directed against the N-terminal part of eRF1. To determine the level of nonsense suppression in the different SUP45 mutants a vector based assay system for quantification of nonsense codon readthroughin vivo was employed . β-galactosidase activities measurements in the mutants are consistent with the results obtained for auxotrophy (Figure 2A): the parent strain does not possess any suppressor activity. In the omnipotent mutants tested, nonsense suppression levels of all stop codons were high (between 8- and 28% for UAA; between 10- and 25% for UAG, and between 22- and 42% for UGA) (Figure 2B). Since the C-terminal region of eRF1 is essential for cell viability [10, 11], some full-length eRF1 should be present even in strains bearing sup45 nonsense mutations (which will be referred to as sup45-n, where n equals n onsense), probably by readthrough of the stop codon. An affinity-purified anti-eRF1 antibody was used in the Western blot analysis to examine eRF1 levels in SUP45 mutants. As shown in Figure 2C, there was a considerable amount of full-length eRF1 in sup45-n strains. Comparison with a wild-type strain revealed a significant decrease in the amount of eRF1 protein. Ribosome fractions isolated from sup45-104, sup45-105, sup45-107 contained a truncated protein with molecular mass consistent with the predicted one (31.5, 43.0 and 35.2 kDa, respectively) (Figure 2C). Western blot analysis did not reveal the presence of truncated protein either in ribosome fractions, or in lysates prepared from sup45-101 strain (Figure 2C and data not shown). The inability to detect such truncated protein with a predicted molecular mass of 29.6 kDa could be explained by its proteolytic sensitivity possibly because of the absence of the ribosome-binding site. The small truncated protein (5.9 kDa) in sup45-102 strain could not be detected. Relative to the level of eRF1 in wild-type strain 1B-D1606 (set to 1), the amount of full-length eRF1 in 101-D1606, 102-D1606, 104-D1606, 105-D1606 and 107-D1606 strains were 0.32, 0.08, 0.13, 0.14 and 0.17, respectively. The highest level of eRF1 in sup45-101 strain corresponds to the lowest level of suppression as measured by β-galactosidase assay (Figure 2B). These results suggest that a very small amount of eRF1 is required for cell viability. The effect of reducing eRF1 on cell viability was evaluated next. All sup45-n mutations (but not all missense mutations, data not shown) lead to temperature-sensitive lethality (Figure 3). Previously, the analogous phenotype caused by opal supK584 mutation in the RF2 gene of S. typhimurium was explained by a reduced level of the mature RF2 protein at higher temperature . To determine whether this was also the case for yeast strains carrying sup45-n alleles, ribosomes were isolated from wild-type strain 1B-D1606 or the 104-1B-D1606 strain after two and four hours of incubation at 37°C. Western blot analysis did not reveal the significant difference in the amount of full-length eRF1 protein at the non-permissive temperature as compared with the permissive temperature both in the mutant and in the wild-type strains (data not shown). Nonsense mutations in the SUP45 gene lead to thermosensitivity. Thermosensitivity of strains bearing sup45-n mutations. The same strains as in (2A) were tested on the rich medium (YPD) at 37°C. Do sup45-n mutations lead to lethality in different genetic backgrounds? The viability of strains bearing nonsense mutations in the essential SUP45 gene may be explained in several ways. It is possible that the parent strain itself contains weak tRNA suppressor. However, the level of readthrough in this strain, measured in a quantitative termination codon readthrough assay, is negligible (Figure 2B). To further examine this possibility plasmid shuffle analysis was performed. The haploid yeast strain 1A-D1628 was transformed with the pRS315 plasmids bearing different sup45-n mutations. In this strain the lethal SUP45 disruption was complemented by the SUP45 gene on an URA3 centromeric plasmid, pRS316. Transformants were then subjected to plasmid shuffle analysis  to verify whether strains containing the sup45-n alleles could lose the plasmid carrying the wild-type gene. Leu+ Ura+ transformants were plated on 5-FOA medium to select against [URA3 SUP45] plasmid. Control cells transformed with [LEU2 SUP45] plasmid grew on 5-FOA. 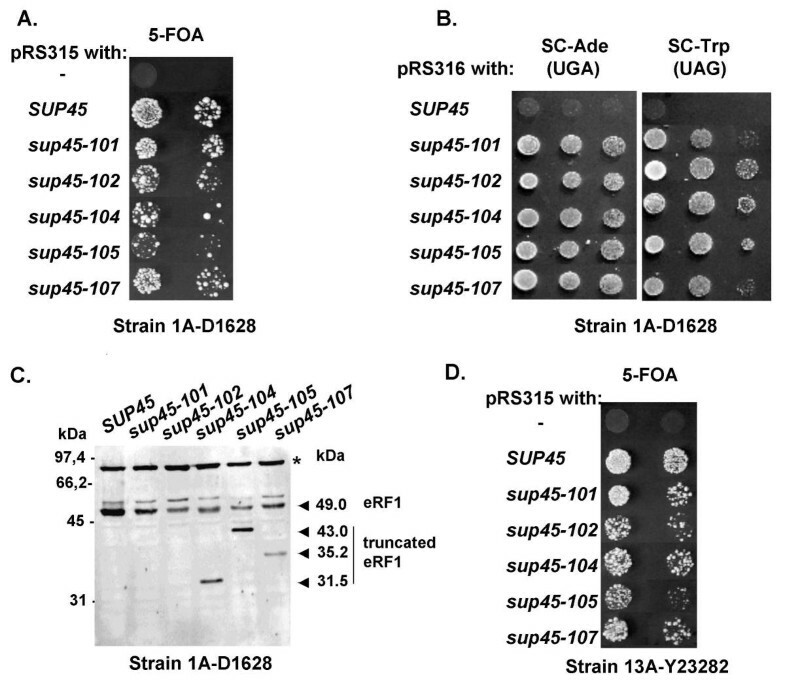 Cells transformed with pRS315/sup45-n plasmids also grew on 5-FOA medium although with different efficiencies (Figure 4A). Ura- Leu+ colonies were selected and tested for adenine and tryptophan auxotrophy. In all cases sup45-n mutations lead to suppression of ade1-14 and trp1-289 (Figure 4B). Again, the Western blot analysis showed that in all SUP45::HIS3 [sup45-n] strains full-length eRF1 had been synthesized to a lesser extent compared with SUP45::HIS3 [SUP45] strain (Figure 4C). Nonsense mutations in the SUP45 gene confer the viability in the different genetic backgrounds. A. Strain 1A-D1628 bearing SUP45 disruption was co-transformed by pRS316/SUP45 and pRS315/sup45-n plasmids. The cotransformants bearing pRS316/SUP45 and vector pRS315 only were used as a negative control. 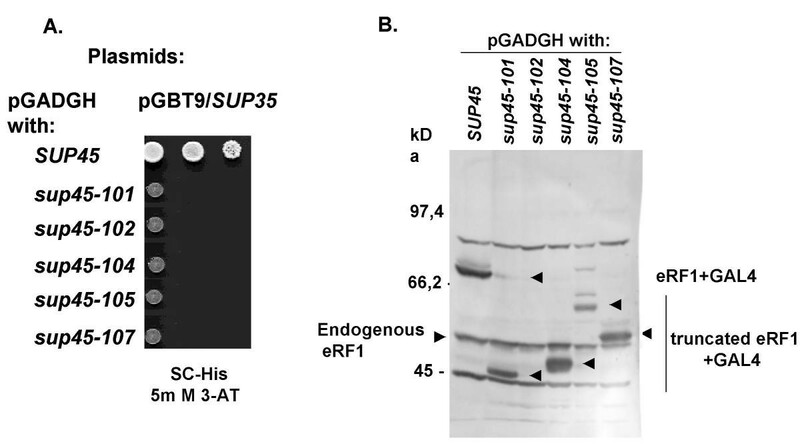 The transformants were assayed for growth by plating on 5-FOA medium to select against the URA3 plasmid pRS316/SUP45 carrying a wild-type copy of SUP45. Ten serial dilutions of yeast suspensions of the same density were used. Five independent transformants for each combination were tested. Representative results are shown. B. Plate assays showing the growth of transformants of 1A-D1628 bearing pRS316/SUP45 or pRS316/sup45-n plasmids on the synthetic medium without adenine (SC-Ade) or tryptophan (SC-Trp) at 25°C. The strains were tested in the same way as in Fig. 2A. C. Western blot showing the expression of full-length eRF1 (49 kDa) and truncated eRF1 proteins in the same strains as in (B). D. Complementation of the SUP45 gene disruption in the strain 13A-Y23282 by sup45-n mutations. The transformants with vector pRS315 were used as a negative control. The same plasmids as in (A) were used. To further confirm that viability of sup45-n mutations could not be explained by the presence of weak tRNA suppressor mutation in the parent strain plasmid, shuffle analysis was performed on the derivative of S288C  whose entire genomic sequence does not contain mutations in tRNA genes . A haploid strain 1A-Y23282 bearing SUP45 disruption and the [URA3 SUP45] plasmid pRS316/SUP45 was transformed with [LEU2 sup45-n] plasmids and the resulting transformants were plated on 5-FOA medium. All transformants were able to grow in the presence of 5-FOA (Figure 4D). The comparison of data presented in Figures 4A and 4D shows that the efficiency of the plasmid shuffle varies significantly among mutations being the least for sup45-105 and the highest for sup45-101. To compare the efficiency of plasmid shuffle quantitatively the maintenance of plasmid with wild-type SUP45 was tested. The haploid yeast strain 1A-D1628 carrying the SUP45 gene on centromeric plasmid pRS315 was transformed with pRS316 plasmids bearing different sup45-n mutations. Cotransformants were plated at 200 cells per Petri dish on YPD medium, grown at 25°C for several days and replica plated on SC-Ura and SC-Leu media. 200 to 500 colonies were tested from 3 independent transformants. All cotransformants were able to lose either [SUP45 LEU2] or [sup45-n URA3] plasmid but with different efficiency. The plasmid pRS316 bearing mutant sup45-n alleles were lost in 15–20% of tested colonies (data not shown). At the same time a very small number of colonies lost pRS315 plasmid with wild-type SUP45. (Table 1, first column). These data are consistent with the result of plasmid shuffle on 5-FOA (Fig. 4A and 4D): again the least frequency of wild-type plasmid loss (0.3%) was obtained for sup45-105 and the highest (6.3%) for sup45-101. a Strain 1A-D1628 bearing disruption of the SUP45 gene (SUP45::HIS3) and the SUP45 gene on pRS315 plasmid was transformed with pRS316/sup45-n plasmids. b The frequency of pRS315/SUP45 loss in cotransformants was determined (I). c Transformants bearing only sup45-n plasmids were selected on SC- Ura medium, re-transformed with pRS315/SUP45 plasmid and the frequency of pRS315/SUP45 loss in cotransformants was determined again (II). At least 3 independent transformants were tested for each plasmid combinations. The average data with standard errors (± SE) are presented. Ura+ Leu- colonies were selected and tested for adenine and tryptophan auxotrophy. In all cases sup45-n mutations led to suppression of ade1-14 and trp1-289 (Figure 4B). Cells bearing pRS316/sup45-n plasmid were re-transformed with pRS315-SUP45 plasmid and the experiment repeated (Table 1, second column). 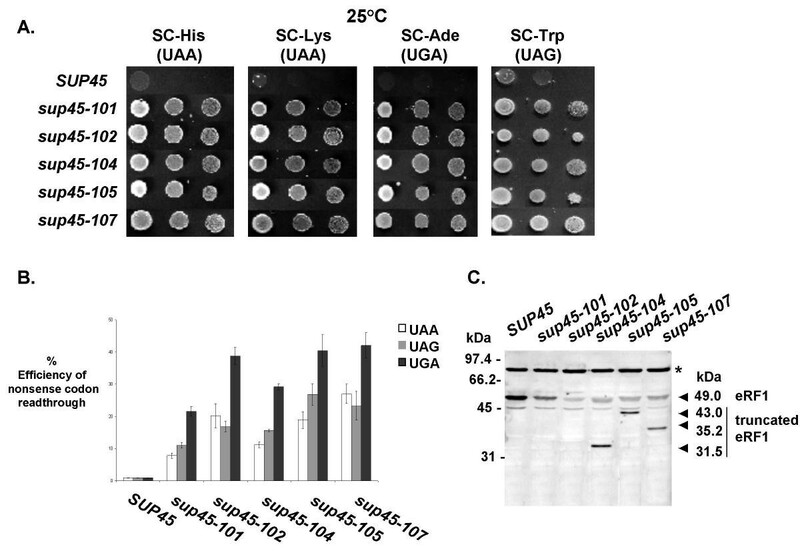 The results show that after growth in the presence of mutant alleles of SUP45 the ability to lose the plasmid with the wild-type allele of SUP45 increased. To determine whether such an increase could be explained by reversions of sup45-n alleles to wild-type allele during shuffle experiments in yeast, the corresponding plasmids were prepared from yeast transformants and sequenced. In all tested cases the presence of sup45-n mutation was confirmed (data not shown). Do nonsense mutations in the SUP45 gene lead to lethality in meiosis? Previously it has been shown that sup45 nonsense mutants, selected in the presence of SUQ5, are not viable in the absence of the SUQ5 tRNA suppressor . In our work such mutants are viable for three distinct yeast strains all of which do not contain SUQ5. Thus the main difference between our data and previously published data  may be explained by different approaches to selection the mutants used. In addition, in our work, plasmid shuffle analysis was used to test the viability of sup45-n mutants as analysis of meiotic products has been used to characterize the viability of sup45-0 (0 because of o chre) mutants . To compare our results to the ones of Stansfield et al. we transformed diploid strain D1628 (a parent strain for 1A-D1628 strain used in plasmid shuffle experiment) heterozygous for SUP45 disruption with plasmids carrying sup45-n alleles and performed tetrad analysis. Table 2 shows that no His+ Ura+ segregants were obtained in the case of the sup45-105 allele (where His+ is the marker for the SUP45 gene disruption and Ura+ – for the plasmid presence). This result cannot be explained by the loss of the corresponding plasmid since the stability of plasmids in all tested diploids were practically the same (Table 2). For all other sup45-n alleles the appearance of His+ Ura+ segregants has been registered, although their amount was less than in the case of plasmids with wild-type SUP45. The presence of sup45-n alleles in His+Ura+ spore clones was confirmed by suppression of ade1-14 and trp1-289 alleles (data not shown). The same results were obtained using another diploid strain Y23282, the derivative of S288C (data not shown). a The amount of His+Ura+ segregants is a characteristic of sup45-n allele presence (His+ is the marker for the SUP45 gene disruption and Ura+- for the pRS316 plasmid presence). The data correspond to the sum of two experiments but the cell number in nonviable colonies was calculated from only one (Table 3). Microscopic examination of the lethal spores from the control strain showed that all were unable to carry out mitotic divisions and stayed at the one cell stage. This result could be explained by loss of SUP45 bearing plasmids. In contrast, in the case of diploids bearing mutant sup45-n alleles most lethal spores form microcolonies of 4 to 20 cells (Table 3), many of which were abnormally shaped buds or abnormally elongated. Apparently, the SUP45::HIS3 [sup45-n] spores can germinate but the cells fail to divide after a few cell cycles. To determine whether the presence of SUQ5 mutation could increase the viability of sup45-n segregants, the diploid strain heterozygous for both the SUQ5 and sup45-n alleles was sporulated and tetrads were analyzed for cell viability and suppression (Table 4). As expected, SUQ5 mutation significantly increased the frequency of His+ Ura+ segregants for all sup45-n mutations except sup45-107. These data are consistent with the known properties of SUQ5 tRNA to suppress UAA, but not UGA codon . The readthrough of sup45-n mutations could be explained in several ways such as a decreased level of eRF1 or weak termination context surrounding sup45-n mutations. To assess these possibilities we determined whether the sup45-n alleles could be reassigned in the presence of wild-type SUP45 allele. For this purpose the two-hybrid system was used . This approach allows us to distinguish full-length eRF1 encoded by the SUP45 gene from the readthrough product encoded by the sup45-n allele. It is known that the interaction of eRF1 with eRF3 is mediated by the C-terminus of eRF1 [20, 21]. Thus, in the absence of readthrough, no truncated eRF1 proteins encoded by sup45-n alleles will interact with eRF3. Accordingly, yeast eRF3 fused to GAL4DB in vector pGBT9 and eRF1/Sup45 fused to GAL4AD in vector pGADGH were introduced into strain HF7C separately or together and tested for activation of HIS3 reporter gene. In the control experiment co-transformants harboring either of the plasmids and a vector alone (pGBT9 or pGADGH) did not grow in the absence of histidine. The co-transformants harboring both yeast (eRF3/Sup35and eRF1/Sup45) full-length proteins were used as a positive control. Figure 5A shows that only co-transformants bearing full length eRF1 and eRF3 proteins grew on the selective medium with 3-amino-1,2,4-triazole (3-AT), while co-transformants carrying truncated variants of eRF1 did not. Expression of sup45-n mutations in the presence of wild-type amount of eRF1 protein does not lead to readthrough. A. Two-hybrid interactions. Strain HF7C was co-transformed with pGADGH plasmids carrying different sup45-n mutations and pGBT9/SUP35 plasmid. The interactions were tested by the extent of resistance to 3-AT. Ten serial dilutions of yeast suspensions of the same density were used. Five independent transformants for each combination were tested. Representative results are shown. B. Western blot showing the expression of full-length eRF1+Gal4 and truncated eRF1+Gal4 proteins with predicted molecular mass in the same transformants as at (A). Western blot analysis revealed the presence of fusion protein as well as wild-type eRF1 protein for all transformants, except sup45-102 (Figure 5B). No readthrough proteins were observed for any of the plasmids bearing sup45-n mutations except sup45-101, for which a small amount of readthrough fusion protein was detected. Thus, in the presence of a normal amount of wild-type eRF1 the readthrough of sup45-n alleles is completely repressed. In this study we have shown that yeast containing nonsense mutations in the SUP45 gene can be selected for as viable strains. The product of this gene, translation termination factor eRF1, is essential and even small deletions from its C-terminus (about 30 amino acids) are lethal [20, 21]. Consistent with this, we have shown that the full-length eRF1 protein is present in all mutants bearing sup45-n alleles, although in smaller amounts. There are several processes known that can overcome the effect of nonsense codons, such as suppression by either mutated or natural cellular RNA [reviewed in ]. The readthrough of in-frame stop-codon could be also programmed by weak termination context and/or RNA-secondary structure elements [see  for recent review]. Many of the commonly used E. coli laboratory strains as well as wild-type populations contain UAG suppressor tRNAs . For S. cerevisiae such data are unknown. The existence of a mutated nonsense-suppressed tRNA gene in the genetic background of the parent strain employed in our study is unlikely, because of the codon-specificity of such suppressors: in our work both ochre (UAA) and opal (UGA) sup45-n mutations have been isolated. Further the parent strain as well as strains used for testing viability of sup45-n mutations, do not possess any suppressor activity. Moreover, no mutations in the tRNA encoding genes were found in strain S288C , the derivative of that used in our plasmid shuffle experiments. Viable opal nonsense mutation (supK584) in the essential gene prfB encoding bacterial release factor RF2 had been described in S. typhimurium . It has been shown that this mutation reduces the cellular amount of RF2. Such a reduction in RF2 level leads to inefficient termination of translation and thus to autosuppression. Nonsense mutations have been also isolated in the essential SUP35 gene encoding translation termination factor eRF3, both (sup35-2 (UAG) and sup35-21 (UAA)) [41, 42] being viable. Thus, different translation termination factors, such as RF2, eRF1 and eRF3, have a common property – the viability of nonsense mutants for their encoding genes. Nonsense mutations in the SUP45 gene (sup45-0) in SUQ5-ochre suppressing background have been previously isolated; nevertheless, they could not support viability in the absence of SUQ5 mutation leading to lethality in the crosses with wild-type strain . It is well known that the relative efficiency of termination depends on the local sequence context surrounding the termination codon [reviewed in [1, 2, 43]]. In numerous experiments in E. coli it has been shown that the most important determinant of termination efficiency is the nucleotide immediately following the stop codon (the +4 base). This suggests that the translation termination signal consists of four nucleotides [39, 44]. Statistical analysis of sequences surrounding stop codons at natural termination sites has also shown a significant bias in the bases around the stop codon, the most marked of which is the nucleotide immediately following the stop codon [reviewed in [39, 43]]. This analysis identified contexts that favor termination in vivo in different organisms, among which were E. coli and S. cerevisiae. Although this context is different in bacteria and yeast, there is a quite good correlation between the frequency of +4 nucleotide occurrence at natural sites and termination efficiency of tetranucleotide stop codon [44, 45]. For UAA stop codon the termination efficiency is influenced by the fourth position in the order G > A > U ≥ C (from most efficient to least efficient termination) and the most frequent +4 context in S. cerevisiae is A, while C is less frequent . In accordance with these data the relative level of eRF1 full-length protein correlates with the strength of the translation termination signal (Table 5). No UAAA mutations were isolated in our screen. For UGA stop codon the translation efficiency is influenced by the fourth position in the order G>U>A>C, while for UAG the order is different (A>U>C>G) . Indeed, sup45-107 (UGAA) mutation, as well as other sup45-n mutations, is situated in a weak termination context. Thus, premature stop codons in the SUP45 gene can be suppressed with relatively high efficiency depending on the surrounding sequence. Interestingly, all sup45-0 mutations, that led to the appearance of an in-frame UAA stop codon , were situated in the strongest +4 context where purine was presented in fourth position. However the discrepancy between our data and that of Stansfield et al. cannot be explained by different context influence because one viable sup45-n mutation which is completely identical to sup45-18  has been isolated (Borchsenius, Zhouravleva, unpublished). Also, the readthrough of premature stop codons in the SUP45 gene cannot be explained only by weak termination context because in the presence of wild-type eRF1 protein there was no readthrough of fusion Gal4-Sup45-n mRNAs. Interestingly, the possibility of isolating viable nonsense mutations in the SUP45 gene due to the existence of wild-type tRNAs in the yeast cytoplasm has been predicted . Natural nonsense suppression is a widespread mechanism of translation regulation [reviewed in ]. To date, the ability of different yeast tRNA to translate all three stops codons has been shown [46–48]. Experiments are in progress to identify the precise mechanism leading to readthrough of sup45-n mutations. Although sup45-n mutations do not lead to lethality in different genetic backgrounds, their viability increased after growth in the absence of wild-type allele. The maintenance of plasmid containing a wild-type copy of the SUP45 gene changed: the frequency of its loss was very low compared with plasmid bearing sup45-n mutation, however, this frequency significantly increased after reshuffle of SUP45 bearing plasmid in sup45-n mutants. In crosses between the sup45-n strains and the wild-type strain the viability of segregants bearing sup45-n alleles was higher than in meiotic progeny of diploid cells heterozygous for SUP45 disruption. Possibly, additional mutations were selected during the first stage of selection, or, alternatively, a decreased level of eRF1 could influence expression of other components of the translation termination complex. Further studies are necessary to identify the precise mechanism of this phenomenon. It is known that high levels of nonsense suppression in yeast are lethal . Most of sup45-n mutations lead to decreased spore viability. Spores bearing sup45-n mutations are characterized by limited growth after germination leading to the formation of micro-colonies of 4 to 20 cells. The arrest of cell division in sup45-n bearing spores cannot be explained by the presence of some residual eRF1 protein derived from the heterozygous diploid. It has been shown that disruption of the SUP45 gene leads to blockage of the cell cycle at the START of G1, manifested as the inability of spores to produce microcolonies . Interestingly, the presence of mutated suppressor tRNA also led to increase spore lethality  and to the arrest in cell division at approximately the 50-cell stage . The combination of sup45-n alleles with SUQ5 mutation restores the viability of sup45-n spores as well as sup45-0 mutations . All sup45-n mutations (but not all missense mutations) led to thermosensitivity. The data concerning the efficiency of translation termination at different temperatures are controversial: for S. typhimurium it was higher at 42°C than at 37°C in both supK584 and wild-type strains . However for S. cerevisiae the efficiency of termination did not change in wild-type strain, but was lower at 33°C than at 30°C in the sup45 mutant . We did not find a significant difference in the amount of full-length eRF1 protein at the non-permissive temperature as compared with the permissive temperature both in the mutant sup45-104 strain and in the wild-type strain. 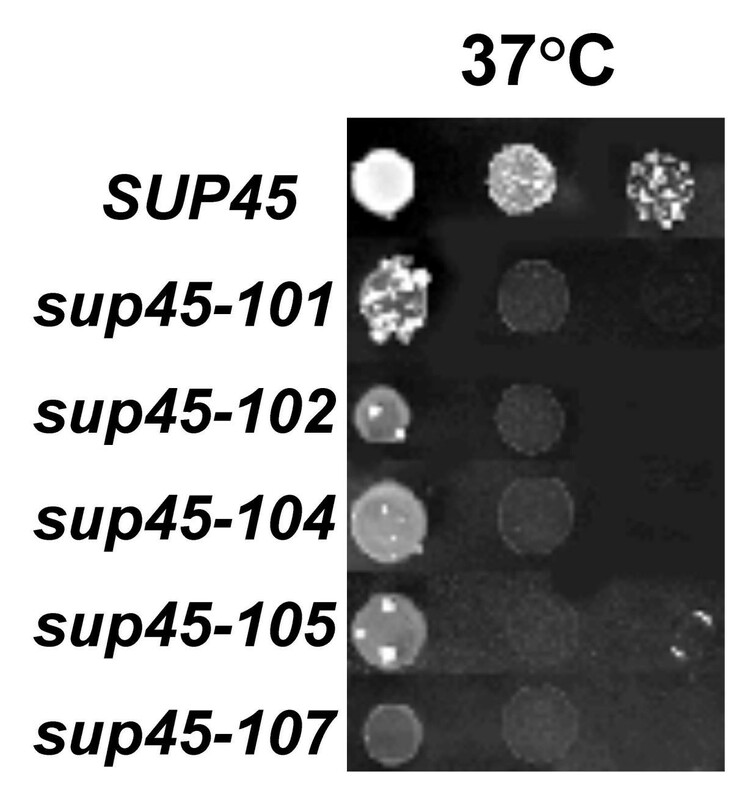 Thus thermosensitivity of sup45-n mutants cannot be explained by the further reduction in the amount of eRF1 protein produced in the mutant at high temperature as proposed for RF2 protein in supK584 strain . The sup45-n mutations lead to a high level of nonsense codon suppression (up to 42% for UGA stop codon when measured in the β-galactosidase assay) because of decreased level of eRF1. This result is consistent with previous findings [29, 53]. However, additional causes cannot be excluded as the full-length eRF1 protein produced in sup45-n mutants contains missense substitutions at the amino acid positions corresponding to the premature stop codons. Indeed, most of sup45-n mutations are situated in highly conserved regions of eRF1 (data not shown). Previously it has been shown that truncated eRF1 proteins of 411, 360 and 359 amino acids were still able to bind to the ribosome . In our experiments truncated eRF1 proteins of 384, 316 and 282 amino acids, but not of 265 amino acids, bind to ribosome. This result suggests that the eRF1 ribosome-binding site is localized between amino acids 265 and 282. Consistent with these data, it has been previously proposed that for human eRF1 a ribosome-binding site includes amino acids 246 to 270 . The eRF3-binding site on S. cerevisiae eRF1 is located in the C-terminal region, in particular the deletion from eRF1 of the 19 C-terminal amino acids abolish its interaction with eRF3 [20, 21]. The two-hybrid analysis used in our work confirms that loss of the extreme C-terminus of eRF1 abolishes its interaction with eRF3. The studies described above raise a question about mechanisms leading to viability of nonsense mutations in essential genes. To date such mutations have been isolated in the several essential genes of S. cerevisiae [41, 42, 54, 55] and the existence of different mechanisms has been proposed. Viability of pol3 nonsense mutations has been explained by the presence of [PSI+] factor encoded by the SUP35 gene in the parent strain, which leads to readthrough of stop codons in the mutated POL3 gene . Analysis of snm1 nonsense mutations revealed that these mutations are suppressed by amplification of the plasmid carrying snm1 alleles. Plasmid amplification leads to an increase in SNM1 mRNA level, which, is believed could led to a partial readthrough resulting in the appearance of full length Snm1 protein. Interestingly, snm1 mutations do not result in translation infidelity suggesting that translation suppression was specific for the SNM1 gene . The viability of sup35-2 and sup35-21 mutations was explained by reduction of eRF3 level that causes inefficient termination of translation and leads to autosuppression [41, 42]. However, the precise mechanism leading to readthrough of these mutations, as well as sup45-n mutations, remains unclear. Future studies will include the identification of components that can participate in this process. The data presented in this work show that nonsense mutations (sup45-n) in the SUP45 gene can be isolated and that such mutations support viability in different genetic backgrounds. All these mutations lead to a decreased level of full-length eRF1 protein and thus to the ability to suppress other nonsense mutations. It could appear that a very low level of eRF1 (up to 10% relative to wild type) is sufficient to support viability. All sup45-n mutations are situated in weak +4 termination context and the relative level of eRF1 full-length protein correlates with the strength of the four nucleotide translation termination signal. Most of sup45-n mutations lead to decreased spore viability and thermosensitivity. Our data confirm that the site of interaction with eRF3 is localized in the C-terminus of eRF1. Our results suggest that the ribosome-binding site of yeast eRF1 is localized between amino acids 265 and 282. The Saccharomyces cerevisiae strains used in this study are listed in Table 6 (see additional file 1). All strains were [psi-]. Strains BSC483/4c and D1628 have been described earlier [56, 57]. Yeast cultures were grown in standard rich (YPD) or synthetic (SC) media  at 25°C. Usually, omnipotent SUP45 mutations are selected by reversions of two nonsense mutations of different types (for example, UAA and UGA) [see  for review], this decreases the probability of obtaining mutations in tRNA genes. In this work we used reversions of two nonsense mutations of the same type (UAA). The yeast strain 1B-D1606 containing nonsense mutations of all types have been constructed. For selection of suppressor mutants, simultaneous spontaneous reversions to histidine and lysine prototrophy were employed. His+ Lys+ revertants were crossed with strains bearing sup35 or sup45 mutations to identify SUP45 mutants. Standard methods of yeast genetics were used . Transformants were grown in the media selective for plasmid maintenance (SC-Trp, SC-Leu, SC-Ura). Suppression of nonsense mutations was estimated by growth at 25°C on synthetic media lacking the corresponding amino acids. To determine the frequency of plasmid loss transformants were plated at 200 cells per Petri dish on YPD medium, grown at 25°C for several days and replica plated on SC-Ura or SC-Leu media. About 200 to 500 colonies from 3 independent transformants, were tested. For plasmid shuffle, selective medium containing 1 mg/ml 5-fluoroorotic acid (5-FOA, Sigma) was used. Yeast transformations were performed as described previously . 3-AT plates contained different concentrations of 3-amino-1,2,4-triazole (Sigma). The two-hybrid interactions were assessed by the ability to transactivate HIS3 reporter gene (to confer growth in the absence of histidine and in the presence of different concentrations of 3-AT). Bacterial strains used in the work were JM109 (recA1 supE44 endA1 hsdR17 gyrA96 relA1 thi Δ (lac-proAB) F' [traD36 proAB+lacIqlacZΔM15])  and XL1-Blue (recA1, endA1, gyrA96, thi-1, hsdR17, supE44, relA1 [F', proAB, lacIq, Δ(lacZ)M15, Tn10(tet)]) . For quantitative characterization of nonsense suppression in sup45 mutants β-galactosidase reporter system  was used. Mutants were transformed with pUKC815 plasmid containing PGK1-lacZ fusion (control) or with pUKC817, 818, 819 plasmids carrying TAA, TAG, TGA (termination codons), respectively, cloned in frame with lacZ. β-galactosidase activity was determined as described . Only in the case of nonsense suppression could active β-galactosidase be synthesized. Efficiencies of suppression were calculated as a ratio of β-galactosidase activity in cells harboring lacZ with premature termination codon to that in cells with a normal allele of lacZ. Values for liquid β-galactosidase assay represent the mean of at least three assays from each of three independent transformants. Plasmid DNA was isolated as described . Yeast genomic DNA was prepared using a lyticase (Sigma) and genomic DNA purification kit (Promega). The SUP45 ORF was amplified by PCR from the genomic DNA of yeast strains using oligonucleotides corresponding to the 5' of the ORF (82 – CATTTCGGCTTGTCTCC or 99 – TTTGTGATTCCATGAAGAGGATAACAGA CT) and an oligonucleotide, complementary to the 3' end of the ORF (83 – TCTGGCATCTAGTGATTAAATTC). PCR reactions were performed using Taq or Pfu polymerase (Promega) as recommended by the manufacturer. Sequences of PCR primers used for double strand sequencing were: 82, 83 (see above), 45 – CGACTGCACCTAAATCCAATG, 87 – CCTCATTATCCTCGGCATC, 92 – GTTCGATGTCAAAAGTGAC, 93 – GACGAAATTTCCCAGGACAC, 94 – CAAAAACTTCGGTGCTAC, 100 – GACATCGAACCTTACAAACCTATC, 101 – ctgctatcacttccacccaac, 104 – GAAAGGTCGCCGAAGTTGCTG, 105 – CAGCAACTTCGGCGACCTTTC. At least two independent PCR-products were sequenced and subcloned in pGEM-T vector (Promega). The presence of a mutated allele in pGEM-T plasmid was verified by sequencing. Plasmid pRS316/ySUP45 was constructed by subcloning the XbaI-HindIII fragment from pYex-SUP45 (a gift of V. Kushnirov) in the same sites of pRS316 . Plasmid pRS315/SUP45 was described earlier . Plasmids pRS316/sup45-101, pRS316/sup45-102, pRS316/sup45-104, pRS316/sup45-107 were obtained by substitution of the BglII-EcoRI fragment of pRS316/SUP45 for BglII-EcoRI fragments from pGEM-T/sup45-101, pGEM-T/sup45-102, pGEM-T/sup45-104 and pGEM-T/sup45-107, respectively. Plasmid pRS316/sup45-105 was obtained by substituting the BglII-BamHI fragment of pRS316/SUP45 for BglII-BamHI fragment from pGEM-T/sup45-105. Plasmids pRS315/sup45-101, pRS315/sup45-102, pRS315/sup45-104, pRS315/sup45-105, and pRS315/sup45-107 were obtained by substituting BglII-BamHI fragment of pRS315/SUP45 for BglII-BamHI fragments from pRS316/sup45-101, pRS316/sup45-102, pRS316/sup45-104, pRS316/sup45-105 and pRS316/sup45-107, respectively. Plasmids pGBT9/SUP35 and pGADGH/SUP45 were described previously . Plasmids pGADGH/sup45-101, pGADGH/sup45-102, pGADGH/sup45-104 and pGADGH/sup45-107 were obtained by substituting BglII-EcoRI fragment of pGADGH/SUP45 for BglII-EcoRI fragment from pGEM-T/sup45-101, pGEM-T/sup45-102, pGEM-T/sup45-104 and pGEM-T/sup45-107, respectively. Plasmid pGADGH/sup45-105 was obtained by substituting BglII-BamHI fragment of pGADGH/SUP45 for BglII-BamHI fragment from pGEM-T/sup45-105. Yeast cultures were grown in YPD medium or in a medium selective for plasmid markers. Ribosomal fractions were prepared as described . From ten to twenty μg of the proteins were separated on 12 % SDS-polyacrylamide gel according to Laemmli , and transferred to a nitrocellulose membrane (Immobilon-P). Western blot analysis was performed with 1/100 diluted polyclonal rabbit antibodies that were obtained against mixture of peptides from the N-terminal (CLTDEYGTASNIKSRV) and the C-terminal (VDESEDEYYDEDEGS) regions of S. cerevisiae eRF1 and then purified against the N-terminal peptide of eRF1. Bound antibodies were detected using the Amersham ECF system (Amersham Pharmacia Biotech) and the Storm 840 PhosphorImager (Molecular Dynamics, USA). Signal intensities were quantified using ImageQuaNT 5.2 software (Molecular Dynamics, USA). We are very grateful to M. Tuite and V. Kushnirov for yeast strains and plasmids; to C. Le Goff for her technical assistance and to M.D.Ter-Avanesyan for very helpful discussion. We thank H.B.Osborne for reading the manuscript. This work was supported by common grant from CNRS (PICS 1113), S.M., S.Ch., S.I-V., G.Z. from RFBR (00-04-22001NCNI_a), S.M., S.Ch., S.I-V. from CRDF No.ST-012-0, S.I-V., G.Z. from CRDF RB1-2336-ST-02. S.M from INTAS(YSF-00-19). SM has done the most of experiments described in this paper, GZ and SS performed initial cloning and sequencing of the sup45 mutations. SI, MP and GA supervised the work and participated in it coordination. All authors read and approved the final manuscript.